Whether your goal is having fun, getting fit or encouraging family-friendly activities, a trampoline is a great addition to any backyard. There are quite a few trampoline options available, but it is important to find the right option that is safe, durable, and strong enough for adults and children. This guide will help you find the best trampoline for adults and children alike. We highlight what to look for when buying a trampoline, how to gauge quality, how to stay safe while having fun, and we highlight some of the better brands and options when choosing your new trampoline. 2 Layers of Springs! 88 Primary Black High Performance Springs + 44 Black PowerSprings = a 12' trampoline with state-of-the-art, adjustable, Patented PowerBounce technology that will improve both shock absorption and bounce performance. Convenient built-in safety rest zones. Kids can rest and wait their turn safely on our reinforced Extra-Thick Pad. Patented Unforgettable overlapping doorway eliminates fall-outs for parental peace of mind. Includes our STRONGEST, easy-to-install, safety net system - rated to 295 lbs! Exceeds ASTM Impact Performance Test standards. Fun for all ages! Engineered with 50+ safety innovations & patents. Family owned by the inventory of the safety net. The JumpSport AlleyOOP PowerBounce trampoline is an outstanding choice by an outstanding company. JumpSport is a family-owned US-based company that has been in the trampoline business for 20 years. The PowerBounce technology consists of 96 high-performance springs along with 48 PowerSprings on the 14-foot model. This additional spring system allows for fine-tuning of the bounce for different skill and weight levels. The result is improved bounce performance and shock absorption. This model comes with a safety enclosure that has a lifetime warranty. This net system is rated at 295 lbs and exceeds ASTM Impact Performance Test standards. JumpSport takes safety netting seriously and they have patented their overlapping door system. This means no zippers and the net is never left open. The net is a vertical design with external mounting. The padding is durable foam encased in a reinforced 21 oz PVC covering. 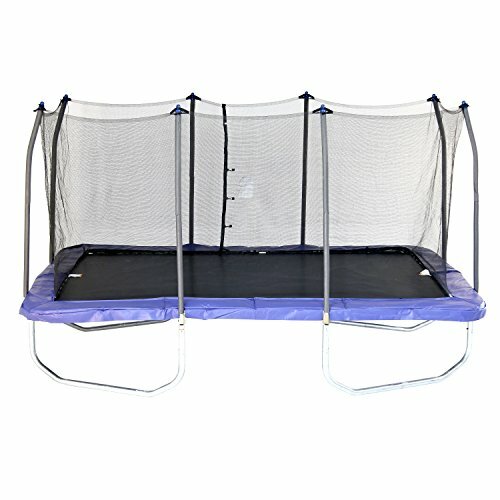 This creates a safe durable place to rest or wait for turns without having to exit the trampoline. This model comes in a 12 foot and a 14-foot option. The single user weight limit on the 12 foot is 260 pounds and 270 on the 14 foot. Real world testing was with a combined weight of 800 pounds. The jumping mat on this trampoline is 35” off the ground, and the frame is a heavy duty galvanized steel frame that is powder coated forest green to blend perfectly in your yard. The ladder is sold separately. JumpSport also offers other fun accessories like a trampoline basketball set, bounce board, and game and party pack. There is also a higher-end DoubleBounce model that has a secondary mat that traps air between two surfaces creating a softer landing. It also slows the energy transfer between the body and jumping surface making it ideal for multiple jumpers. There is also a lower-end Elite model that comes in 10’, 12’, and 14’ sizes. The ACON Air 16 Sport is designed for getting air, a consistent bounce, being heavy duty, and looking really sharp. This is a high-quality rectangular trampoline that comes with a safety net enclosure and ladder. The rectangular shape is perfect for learning tricks, getting air, and just having fun jumping. This trampoline is great for adults and the whole family. There is no single user weight limit. Instead of having to add or adjust springs the Acon Air 16 HD Sport has springs that are specially designed to complement the rest of the trampoline design. This results in a Synergy Design with each spring optimized. Some may feel this is an advantage over installing and adjusting additional springs. This trampoline is supposed to have a great bounce which enables adults to get in their exercise and work up a sweat while having fun. This is a great way to bring the family together and enjoy all of the health and fitness benefits of jumping. The Springfree trampoline really doesn’t have any springs. Instead, it uses rods made from the same super-strong material that some of Boeing’s newest airplanes are made of. This formulation is three times stronger than steel and made to withstand millions of bounce cycles. 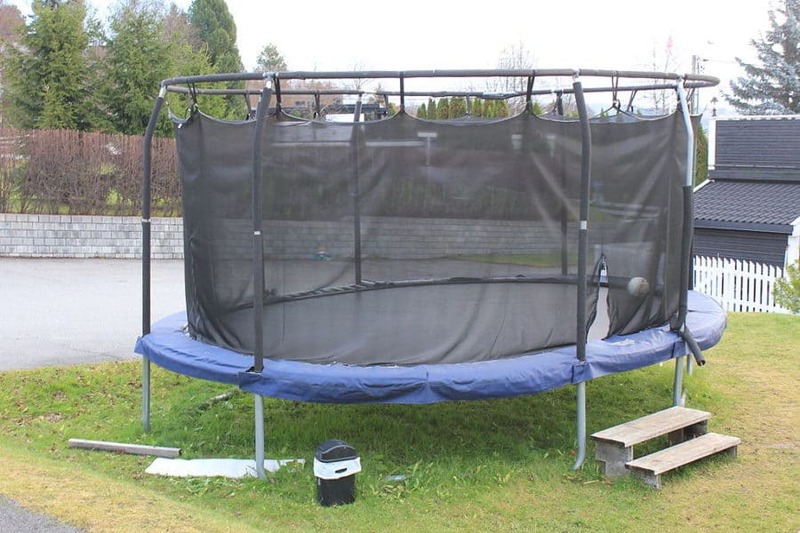 This trampoline was designed by a mechanical engineer who wanted to remove impact areas that are commonly related to trampoline injuries. After 15 years of research, Dr. Keith Alexander designed what he believes to be the world’s safest trampoline. The steel frame has three layers of rust protection and is load tested to 1100 pounds with a 220-pound jumper weight rating. The frame is also located well below the jumping surface eliminating any possible contact with the steel frame. The soft edge mat absorbs 30 times more impact than padding. It has also been tested to withstand 5,000 hours of sun exposure. The FlexiNet is a soft-touch UV resistant net that won’t tear or fray. The net is supported by flexible net rods. 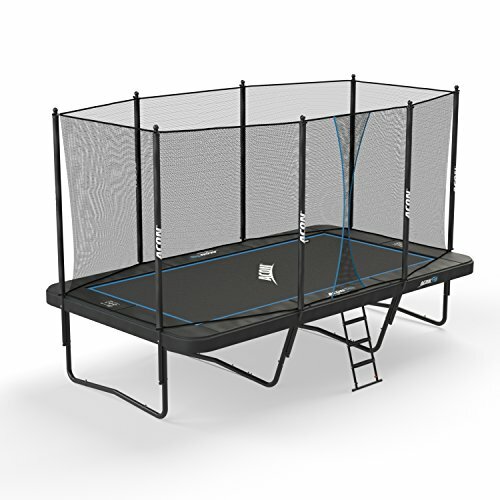 This construction is unique and doesn’t look like other trampolines, but there is no way for jumpers to come into contact with hard metal steel frames, net poles, or springs. This trampoline is sturdy. There are no spaces between the mat and the net. There is no place for feet to slip through or fingers to get pinched. The flexible net can be ran into and bounced off of without causing any injuries. If safety is your main concern, this trampoline should definitely be considered. The Springfree comes in seven different models and you can choose from square, round, or oval shapes. This particular model comes with a basketball hoop and ladder. If the safest and most unique trampoline isn’t enough, you can also purchase their optional tgoma which allows sensors on the mat to connect to your tablet through Bluetooth. You can then play interactive games while you exercise. SAFETY CERTIFICATIONS: Safety is our top priority. The SkyBound Stratos trampoline is laboratory tested, exceeds all US/EU safety ratings and is officially ASTM & EN71 safety certified unlike other low-priced trampolines. BOUNCE & FEEL: Featuring 84 yellow zinc-plated springs at 8.5 inches long providing a responsive yet plush feel you won't get from trampolines with smaller spring lengths. SAFETY ENCLOSURE: Constructed of high-density, UV resistant materials, the patented curved design of SkyBound's 12-pole safety enclosure system allows for a 2-foot safety clearance between the net and the poles with a *new* updated design for 2018. WARRANTY & DURABILITY: UV coatings, black powder coating and yellow-zinc plating all provide superior protection against sun damage and premature rust and corrosion. All SkyBound trampolines are backed by an industry leading 10-year frame warranty. INSTALLATION & SUPPORT: SkyBound's patented no-hassle design allows easy assembly in under one hour with only one tool (included allen key), saving you time and frustration. For immediate help, contact SkyBound's US based support team (Mon-Fri: 8a-5p PST). This is another unique choice that also has some nice safety features. It is ASTM certified, had an industry leading warranty, amazing bounce, and offers superior rust protection. It also boasts assembly in under an hour. The concave safety enclosure protects jumpers from coming into contact with foam padded enclosure poles or the springs that are outside of the net. You can choose between a 12’, 14’, or 15’ model. This is one of the safer models, with a great bounce, and easier setup. Skybound boasts quality construction and components and rigorous testing. The springs are yellow-zinc plated and the frames are black coated to help prevent corrosion, oxidation, and deterioration. You really can’t go wrong with this model for fun, exercise, safety, and ease of assembly. SAFE DESIGN: 76 tightly-coiled springs, 7.6" long are located around the outside of the enclosure net for added safety. Each spring is made of steel with a rust-resistant coating for a longer life. Skywalker is a popular trampoline company that has been around since 2004. They are a popular choice because they meet ASTM safety ratings, have a good bounce quality, and can be on the more affordable side. They offer a 3-year frame and 1-year parts warranty. They also boast a patented no gap safety enclosure that attaches the net at each spring. The galvanized steel frame is weather and rust resistant and the jump mat is a UV protected polypropylene. The rectangular shape is perfect for learning tricks and offers a controlled takeoff and landing. Each leg has reinforced T-sockets for increased stability. The enclosure poles are angled to help prevent dangerous collisions. Professional trampolines are usually the rectangular or large square trampolines. You want a very good bounce with a large weight capacity. Safety is also a big concern. You not only want your trampoline to have a rugged strong construction, but padding and netting and overall design play a big function in preventing injuries if a miscalculation is made. Most athletes and gymnasts use the higher-end professional trampolines to train and practice. If you haven’t experienced a quality trampoline with a great bounce go to an indoor jumping gym and experience what it feels like. 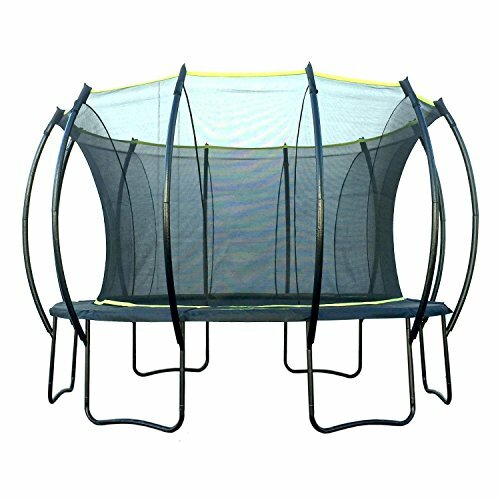 A heavy duty trampoline not only has a large weight capacity but a durable strong frame construction. You want a solid galvanized steel frame that won’t shake or bend with repeated weight or pressure. For backyard trampolines, you also want to consider the durability from sitting in the elements. You want something that is fastened to the ground and won’t take off in a windstorm. The sun is powerful and can weaken any material. You want the mat, pads, and netting to be UV resistant and able to stand up to sun exposure. Moisture is another factor. You need your product to be powder coated, plated, or galvanized in a way that is rust and moisture resistant. An outdoor trampoline will not only get caught in a rainstorm, but there is moisture and dew each morning. There are so many benefits of having a trampoline. It’s a great way to bring the family together, allow children to blow off steam, and for adults to get much-needed exercise. Jumping is not only fun, but it gives you a great workout, and it’s a wonderful way to stay in shape. Benefits range from increased heart health to better immune system functioning. This low-impact form of exercise pumps up your heart without wearing you out. If you don’t believe me, try jumping up and down for 5 minutes and see how you feel. The jumping motion also increases heart rate, blood flow, and aerobic ability. The up-and-down movement helps stimulate your lymph system. This is said to help the body remove cellular waste and clear out toxins and chemicals. In turn, this can help increase your immune system and even help fight off colds and protect you from other illnesses. Jumping up-and-down helps increase your balance and coordination and strengthens your legs, your core, and your entire body. This is one of the few activities that can improve your posture while you are having fun. Jumping is also a great way to burn calories. 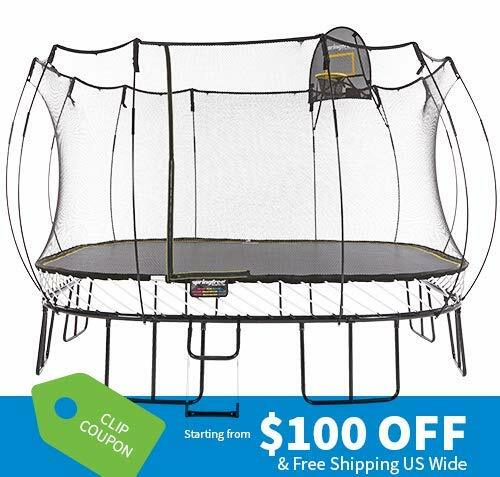 (If you are specifically looking for exercise trampolines, try these mini trampolines). When purchasing your trampoline budget is a concern, but there are also other factors to consider. There is no point in wasting a small amount of money on a product that you don’t like. Trampolines are made for jumping. The quality of the bounce is super important. You want something that can hold the weight of you or your family members and is smooth, low-impact, and non-jarring. Cheap trampolines can be especially jarring for adults and cause injury. Safety is super important. You want to have the proper padding, netting, and protection from impact. Weather resistance is another important factor especially if your trampoline will be in the yard. Setup is another concern. Having a trampoline with fast easy setup can alleviate a lot of pain. JumpSport is a family-owned business headed by CEO Mark Publicover who was inspired to create the first trampoline safety cover in 1995 and started marketing it in 1997. In 1998, he started working on creating safer jumping surfaces that are less jarring. The result is quality trampolines from the JumpSport company. They focus on quality and safety and also manufacture some of the best mini trampoline options, backyard trampoline accessories, and enclosures. In 1992, Tarmo Sallinen was an exchange student in the US. This is where he encountered his first trampoline. In 1996, he began selling trampolines in Finland. His first sale was to a TV magician named Simo. Today, Acon is known as a quality trampoline brand and there have been viral videos of the daring tricks that can be done on a quality Acon trampoline. They also sale ice-hockey products. Springfree is a company that stands behind its products. Their trampolines are backed by a 10-year warranty on the entire trampoline. You can be sure you are getting quality because the trampolines are fully assembled in the factory before being packaged. They are built to last and withstand the harshest weather condition. Springfree products are low maintenance and offer the safest possible jumping solutions. Dr. Keith Alexander spent 15 years designing the product for the ultimate in engineering and jumping safety. SkyBound is a maker of premium trampolines and fitness trampolines. They focus on high-performance safety certified trampolines and accessories. Their products are ASTM certified, and one of the advantages to their unique products is that they are easier to assemble. The Skywalker trampoline company was created in 2004 with a focus on safety and fun. They continue to innovate with new products and technology. 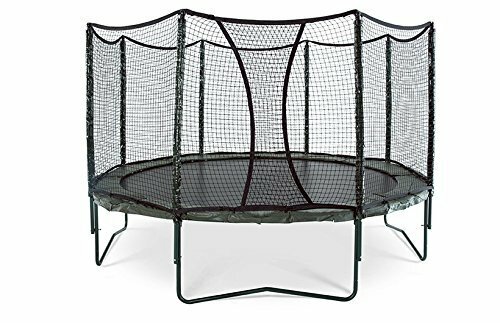 They are a popular brand that offers many options from the massive 16’ square model to children’s trampolines and rebounders. They also have accessories like LED light sleeves to make night jumping even more fun. They have several options of shapes and sizes and some of the largest models have a heavy duty jumper weight of 350 pounds. Q: How do trampolines benefit health? A: By making exercise fun, a trampoline gets you moving. There are added benefits from better coordination and increased core strength to lymph system stimulation. Q: Are trampolines good exercise for adults? A: They are because a quality trampoline is low impact and exercises all areas of the body. You can jump according to your skill level and get the appropriate amount of exercise. Q: Are trampolines safe for adults? A: As long as the impact isn’t jarring to sensitive areas like your knees and back, and you are using safety measures like nets and padding, it should be safe. There is some risk, and common sense and caution are always a good idea. Q: Can I use a trampoline without a net? A: You can, but it increases your risk of injury if a miscalculation is made. Q: Are there trampolines without springs? A: The Springfree brand has a unique design and spring free bounce system. Q: How do trampolines get delivered? A: Trampolines are heavy and are usually shipped or delivered to your house in 1 to 3 different boxes. Q: Can I hire a professional to assemble my trampoline? A: Manufactures, Amazon, and private vendors all offer this service. Assembly can be a chore and having a professional put it together is a great way to start your relationship with your new trampoline. Safety, bounce quality, weight limit, durability, size, and budget are all considerations when choosing the best trampoline for adults. Adults will need a more heavy duty frame with a good bounce. The above options have several quality, safety, and assembly advantages. Choosing the right trampoline will depend on your needs, but the more you educate yourself the better chance you have of making the best decision. Once that decision is made, you can reap the benefits of better health and more fun.